Volcanoes are one of nature's most spectacular and dangerous wonders. When a volcano erupts, flying rock, landslides and lava flows destroy the countryside. An ash cloud forms that can cause health problems and lower temperatures. When Iceland's Eyjafjallajökull volcano erupted in April, 2010, airplanes in Europe were grounded because the ash could harm their engines. The power of volcanoes to disrupt human activity cannot be underestimated. A volcano is a mountain with one or more cracks where liquid rock, or "magma," can travel upward from deep within the earth. Once it reaches the surface, the magma is called "lava." The Earth's heat melts the magma and causes gases inside the mountain to expand. When the pressure from these expanding gases builds, an eruption may occur. Liquid rock pushes through the mountain's cracks and spews upward, along with gas and other material. 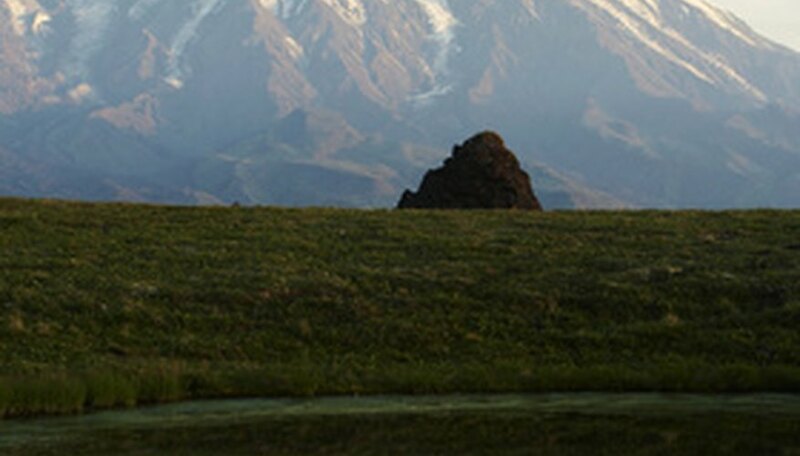 Cinder cones look like fat, upside-down ice cream cones with a vent, or opening, at the top. Sometimes a caldera forms in this vent. A caldera is a circular depression that occurs when the center of a volcano collapses into itself. Composite volcanoes have steep, narrow sides. Several mountains in the Cascade range, including Mt. Rainier, fall into this category. Shield volcanoes are short, bowl-like hills with gradually sloping sides. When the lava isn't thin enough to flow away from an erupting volcano, it piles up near the vent and forms a lava dome. The dome often creates a "plug" that closes the vent. If the plug shifts, the volcano may erupt. A large eruption does a lot of damage. A pyroclastic flow is a mixture of hot gas and bits of rock, ash, pumice and glass. It ejects from the volcano and moves very quickly, destroying trees and homes. If the pyroclastic flow becomes saturated with water, it can change into a lahar--a mudflow. A lahar may pick up large objects and deposit them as much as 50 miles away. The lava flow also damages the landscape, changing it for centuries to come. An ash cloud may rise 12 miles into the air in as little as 30 minutes following a volcanic eruption. This cloud spreads over a wide area, and particles may be dangerous if inhaled. Volcanoes have a dramatic effect on climate. When Mt. Pinatubo erupted in 1991, the average temperature dropped and affected harvest dates around the world. 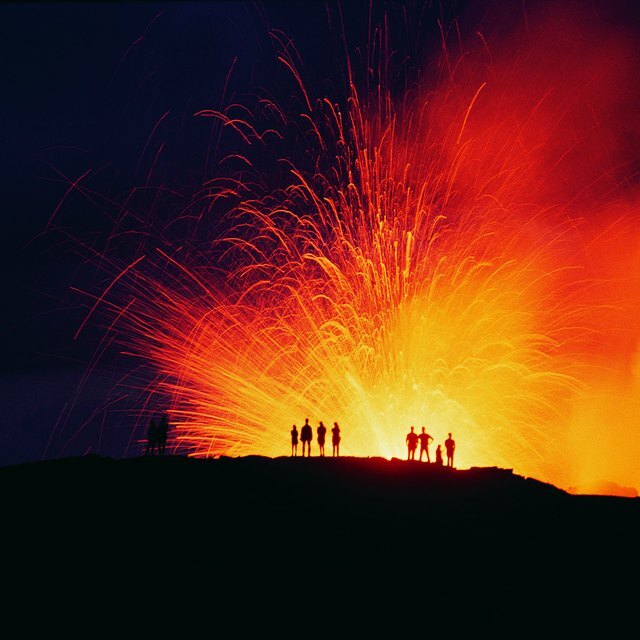 In 1815, a volcanic eruption caused famine in both America and Europe. Over time, however, volcanic carbon dioxide may actually increase temperatures. Eruptions that occurred eons ago may contribute to global warming today. The ground you walk upon was probably deposited by a volcano. Over 80 percent of the Earth is covered by volcanic rock. Volcanoes also formed the atmosphere we breathe. Mt. St. Helens in Washington state had been dormant, or asleep, for more than a century before it erupted on May 18th, 1980. It caused over a billion dollars in damage. The Ring of Fire, an area of coastline encircling the Pacific Ocean, boasts more than 250 active volcanoes. Some are in California, Oregon, Washington and Alaska. U.S. Geological Service: What Are Volcano Hazards? Cook, Kathleen. "Volcano Information for Children." Sciencing, https://sciencing.com/volcano-information-children-6740981.html. 25 April 2017. Do Volcanoes Pollute the Atmosphere?